I was walking in downtown Montreal today and couldn't help but notice this bike. It was locked with a proper U type lock, but there was enough space left between those bars to let the Titanic pass through! Some thief could easily put a spreading tool in there and pop that lock. But the one element that got my attention was that empty seat tube. The owner chose wisely to remove the seat, that is probably held there by a quick release mechanism, but didn't realise that he left his frame open to the elements and the most sinister of enemies, RUST. Rust is that sneaky chemical reaction that makes unprotected metal react with air and moisture to eat away slowly at your pride and joy. The inside of the frame is not painted or protected in anyway against the elements. 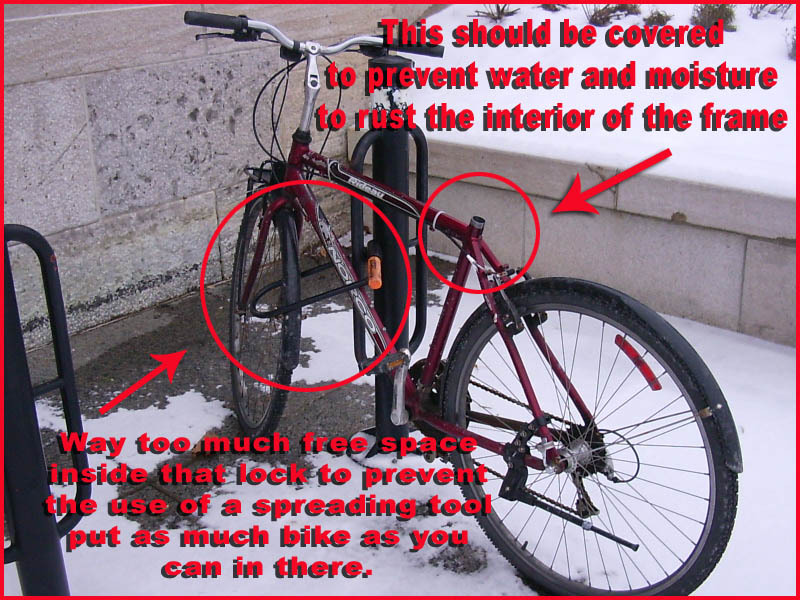 If you have to remove your seat, make sure that you cover it in order to avoid water or moisture to get in there. Once rust starts snacking on the inside of your frame, you're screwed. I had a beautiful cantilever frame cruiser snap a downtube on me because of this(Rest In Pieces "Carbait"). The outside of the frame is also vulnerable to the elements. That paint can get knicked and scratched and the exposed metal will eventually rust. Buy a small amount of touch up paint and do those touch-ups as soon as you find them. If you already have some rust showing, make sure to sand it off before applying the paint. Painting over rust will only mask it until it shows it's ugly face again in a very near future. Til next time ride safe and Godspeed. Thanks for all the great information! Quick question, the other day I was trowing out a paper towel slathered with bacon grease from a frying pan. On my way past my brand new, $20 Craigslist bike (was brand new 20 yrs ago and stored in a basement, what a sweet deal!) I dabbed the chain twice and rear sprocket once with a lil of the grease. I thought that's dumb and wiped it off. The next day out for I ride I stopped at a park and noticed the whole works looked brand new and the oil deeply penetrated. The only information I can find is using animal grease is to be sure to use unsalted. Have you ever heard of this? Really looks great. Thanks again and sorry for the long question. Dan, is it possible that you found another great use for one of the greatest food on planet Earth besides clogging our arteries with it's oh so tasty fat? This is the first I hear about this and I'll be sure to try it out. Thanks for giving me an excuse to throw another pound of bacon in the pan, hmmmmmmmmm...bacon.... No need to apologize, your question was very good and brought water to my mouth. Hey Gerry, I have a short and strange story of the theft of one of my bicycles. Me and two of my friends were at a card shop (this was almost 10 years ago now), and the bike rack was in the back (away from the road) so we figured we'd just jumble up our three bicycles. Mine was in the middle. It was a cheap-o SuperCycle from some megastore, whereas my friends both had dual suspension 21-speeds with all the fixin's. The weird thing was, we come out a few hours later, and only my bike was missing! they had for some reason only wanted to take my bike- why not the others? Any insights to this, I'm still find myself puzzling over it now and then. I think it relates to the same question of why does an old 3 speed bike fetch $150 in the core city of Montreal when the same bike would be worthless in the suburbs. People buy those old cheap bikes on the used market in hopes that its age will prevent it from being stolen. This creates a demand for old junkers, and the market principles being what they are, raises the value at the same time. That's my .02 cents anyway. I read about using wet aluminum foil to get rust off and it's worked very well in an old frame i found rusting away in a garage. I've just got a great second hand race bike and i'm hesitating a bit if i should use foil instead sand paper in some tiny places where the paint has faded and i can see some rust showing. What's your advice? Sand or foil before touching up with paint? If rust is coming out, you must remove it all to prevent it from coming back. In that case I would go with sandpaper. Now that it's cleaned of rust, just spray with a few coats of clear to seal the frame and you should be good for a while. Might be that your garage is very humid. Did you know that you can create short links with Shortest and get money for every visitor to your short urls.